﻿There is an ongoing debate whether we overprescribe and are a culture looking for pharmaceutical fixes. Critics point to drug epidemics in various age groups: ADHD and antipsychotic drugs to children, painkiller and sleeping pill abuse, and the polypharmacy of the elderly. Others, on the other hand, argue that our access to healthcare provide us with leading medicines that steadily improve health and wellbeing. While both sides have valid points, the correct management and taking pharmaceuticals as prescribed is key to optimal outcomes. While some might struggle with adhering to one prescription drug, the management of more can be exhausting. Some drugs cannot be taken together, some needs to be taken with food, some are taken several times a day, and other become harmful due to another medical condition. However, not taking a drug as prescribed can cause serious side effects, and in some cases even be fatal. 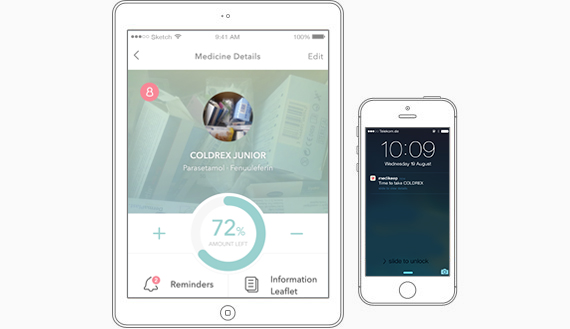 MediKeep is a simple, yet smart and innovative, home pharmacy management app that solves this. By scanning the barcodes on the box of the medication using your smartphone, you can make an inventory and set quantity and dosage. The app will then remind you when to take medicine, vitamins or other supplements, as well as notify when the medications are about to expire or need a refill. The app not only track what you take and when, but keeps a diary where you are able to log side effects, which can be sent to your doctor or be stored on your phone. While the app most likely miss the group with the biggest need for such a solution, the elderly, it has a huge potential and a growing market. The app builds on the growing trend of digital solutions that improve doctor patient communication and deliver a more efficient healthcare service. However, the app could implement new features similar to PillPack, where prescriptions are renewed and refills automatically sent to your home. They could also implement solutions to stop the growing threat of counterfeit drugs. In short, the MediKeep app deliver a smart solution to a growing market. With a few additions to its features however, it has the potential to be an innovative solution to one of the major threats currently faced by the pharmaceutical industry.